This upscale pasta press attachment is for serious homemade pasta enthusiasts. 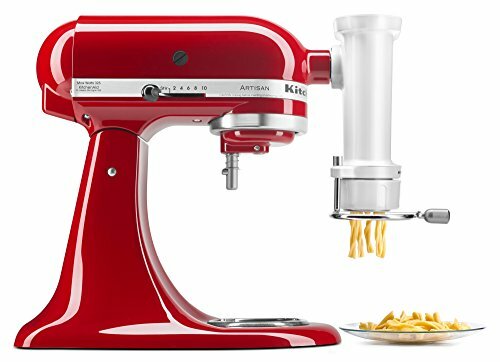 The KitchenAid KSMPEXTA can make six different types of pasta. KitchenAid is one of the largest kitchen appliance companies in the United States. The company has been in operation since 1919. While longevity does not automatically guarantee a good product, it’s nice to buy from brands with some history behind them. In this review, we’ll explore whether this device is worth the hefty price tag or not. You will learn what features the attachment has and how it can suit your needs. This gourmet pasta press attachment is straightforward to set up. All you have to do is fit it to a KitchenAid stand mixer. Unfortunately, it will not work with other mixer brands. Kneading your pasta dough will be the hardest part. Following that, all you have to do is insert the dough into the gourmet pasta press attachment and select your disc of choice. Six discs are supplied and can be used interchangeably to shape different pasta forms. These include rigatoni, spaghetti, bucatini, fusilli, small macaroni, and large macaroni. This is a stand-out feature of the gadget. These six discs cover the most popular pasta types. Your freshly-made food will emerge from the discs in neat, uniform shapes. A wire cutter will let you choose the length of your pasta. This accessory is built in, and gives you an extra measure of control. The simpler pasta shapes are made rapidly at the recommended speed. For more complex shapes, like fusilli, you can expect to wait slightly longer. The same is true if you’re planning to make big batches of pasta. Still, it’s a time saver compared to forming pasta by hand! Instructions will indicate how you should use the pick to thoroughly clean the press after use. One issue is that the tool is small—this can make cleaning a chore. You might want to wait until the dough has dried before picking it off. Soft dough can be quite sticky. The wire cutter cannot be detached from the press. Take care while cleaning this part, to avoid accidental injury. Another potential concern is weight: this press weighs nearly three pounds. It must be perfectly aligned and fit to your KitchenAid Mixer. If not, the attachment can spin off and cause damage to itself, your mixer—or you. This attachment does a good job of turning your dough into pasta. Still, the quality of the dough will impact how your pasta turns out. If the dough is too wet, it will stick together when passing through the discs. This will result in pasta that clumps together and doesn’t hold shape. Dry dough will not pass through the discs easily either. It can stick inside the body of the press. Ideally, you should be running moist, malleable dough through this press. To avoid clumping, sprinkle flour in the bowl your pasta will land in. If your dough is particularly moist, you may want to avoid overloading one container with pasta. Everyone has different pasta dough recipes. The type of flour and quantities of water, eggs, and salt will all play a role. You might find at first that you have to adapt your favorite recipe for the smoothest possible operation. Through trial and error, you’ll figure out the best dough consistency for this press. Admittedly, this can be somewhat frustrating at first. Once you have found the optimal dough texture, though, your pasta should emerge well-formed every time. Is It Worth Getting One? The main advantages of this pasta press are ease of use and range of options. You have six choices of popular pasta shapes and you can decide on their length. It can take some time to figure out which dough recipe works best with the press. The high cost may also be prohibitive, if you’re on a budget. Cleaning the attachment and accessories by hand is often time consuming. Still, this is true of most appliances that cannot be run through a dishwasher. Aside from these issues, this pasta press is a beneficial addition to any pasta maker’s arsenal. You do not need to have a certain level of expertise—anyone can use it. Noodles vs Pasta - What’s the Difference? Linguine vs Fettuccine - What’s the Difference? Ziti vs Penne - What’s the Difference? Newer PostZiti vs Penne - What’s the Difference? Older PostWhat's the Best Oil for Meat Fondue?